Spy shots also reveal the next-gen model's new interior. A pair of next-gen R8 prototypes has been spied testing at the Nurburgring – one wearing practically no camo; the other exposing its interior. A look inside the new R8 reveals a digital TFT instrument cluster, new dashboard and steering wheel, and chromed air vents. Though lacking swirly camo, Audi masked the front and rear end of the other test mule with fake body panels. The new R8 is expected to get smaller headlights, however, as well as a smoother front hood and reshaped grille. At the back, slimmed LED taillights and rectangular exhaust pipes help update the look. 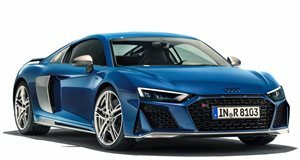 Sharing the platform used by the Lamborghini Huracan, the new R8 will shed some 200 pounds and come powered by 4.2-liter V8 and 5.2-liter V10 powerplants.